Taking place on Jefferson’s birthday, the concert will commemorate not only the University’s Bicentennial but also the important role women have served in its history. As the oldest women’s musical ensemble on Grounds, the Chorus is honored to participate in the community’s celebration by sharing this lovely music. We hope you will be able to join us for this momentous event! From vivacious percussion to ethereal wine glasses, from a cappella to numerous instrumentalists, from the sweet strains of Sing Me to Heaven to an upbeat popular African song, this concert delivers and promises to delight the audience! Come see the Chorus create magic with the Arabic world-fusion piece Sih’r Khalaq, which literally means creative magic! Tickets are $18 for general admission, $12.50 for seniors (65+), and $5 for students. They may be purchased through the UVA Arts Box Office using this link (or call 434-924-3376) or in the lobby of Old Cabell Hall thirty minutes prior to the concert. The Virginia Women’s Chorus is affiliated with the McIntire Department of Music. In addition to the Jefferson Trust, the Chorus is grateful to the UVA Parents Fund, the Vice Provost for the Arts, and the UVA Office of the Dean of Students for assistance with producing this concert. The Virginia Glee Club presents Singfest, an evening of vocal power and charitable action. 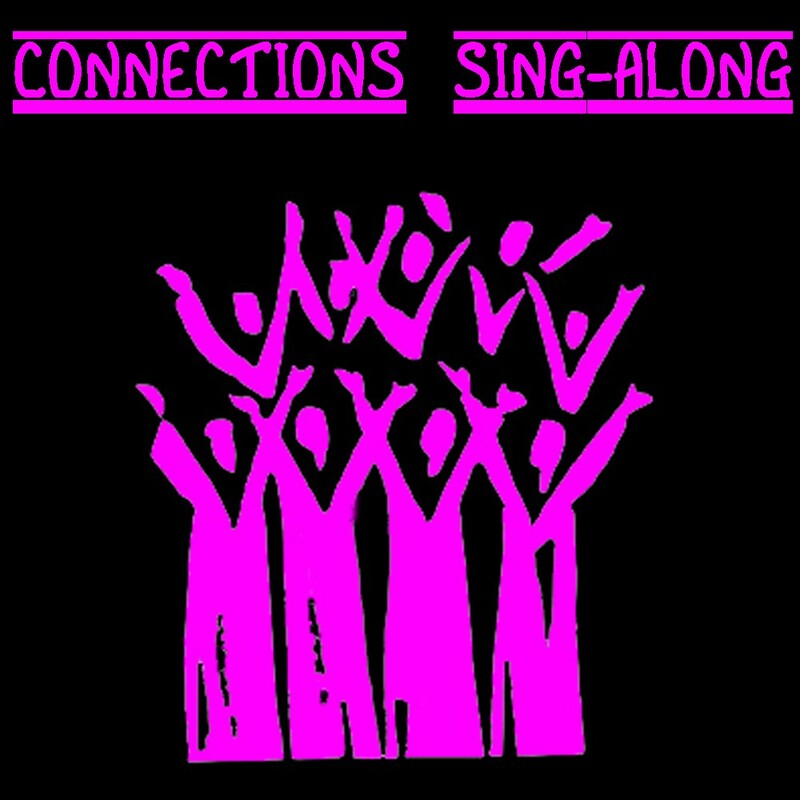 Performances from the Harmonious Hoos, the Flying Vs, Academical Village People, the Virginia Belles, Hoos in Treble, Virginia Gentlemen, the Virginia Sil’hooettes, the Virginia Women’s Chorus, and the Virginia Glee Club. Tickets are $5 and can be purchased online, on the Lawn Feb 11-14, and at the door on the night of the show! Proceeds from this aca-mazing concert go to the Blue Ridge Area Food Bank. Be there to show your support for UVa student vocal groups and to help our community members in need. Contact publicity@virginiagleeclub.org for more information. Step into the wonder and celebration of this glorious season with the Virginia Women’s Chorus! Professional harpist, Anastasia Jellison, will accompany the Chorus for the centerpiece of the concert: Gustav Holst’s Choral Hymns from the Rig Veda, Op. 26. Often called Charlottesville’s best-kept secret, the Candlelight Concerts welcome many returning listeners each year who leave imbued with the spirit of the season. These concerts often sell out, so purchase your tickets early to ensure seating at St. Paul’s Memorial Church on University Avenue. Recognizing the power of music to unite and uplift, the Virginia Women’s Chorus is presenting the 3rd annual Women Against Violence concert Saturday, September 29. This concert, entitled “IMAGINE”, will feature a wide variety of music – folk, pop, classical, and more – shared by musicians from the university and area communities. The International Rescue Committee (IRC) will receive profits from this benefit concert. Several popular a cappella groups, solo musicians, and the Virginia Glee Club will be joining the Chorus in offering reflective and uplifting music. 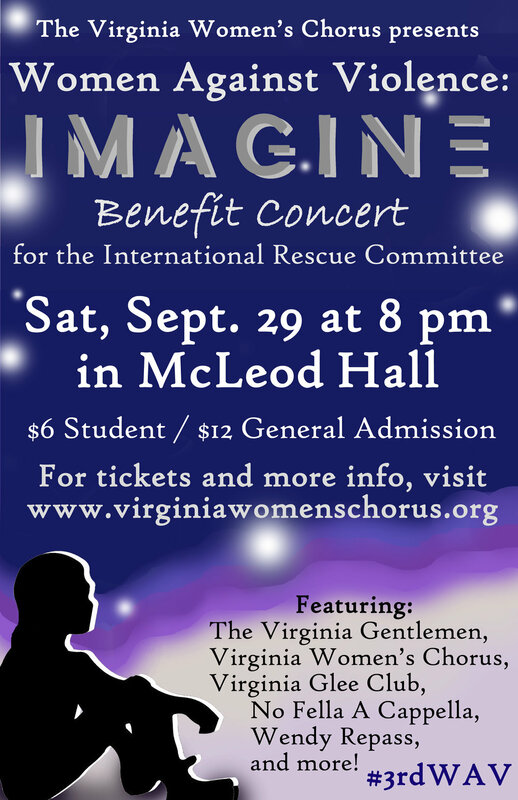 Contemporary popular music favorites include Imagine, specially arranged for this concert by the Director of the Virginia Women’s Chorus, Katherine (KaeRenae) Mitchell. Singers from the university and the community will raise their voices in the collaborative gospel piece, Still I Rise. This finale, based on the poem by poet laureate Maya Angelou, salutes the strength and determination to persevere through adversity and life’s difficulties. Tickets may be purchased through Eventbrite and at the door. Student tickets are $6 and general admission is $12. We hope to see you Saturday, September 29, at 8 PM in McLeod Hall. Be a part of this annual event at UVA and walk away inspired. Imagine all the people living for today, living life in peace, and sharing all the world! Featuring work from UVA faculty members Judith Shatin and John D'earth. We're heading to New York, NY for our final stop on tour! We'll be collaborating with Barnard College and Columbia University. We're staying right outside Philidelphia, PA for our third stop on tour-- a collaborative concert with Haverford area choirs! Our second stop on tour is just outside Philadelphia, PA for an informal concert at St. John Neumann Roman Catholic church. The tour will begin with a Connections Sing-along in NoVa with our alumnae and then the Chorus heads north to the Philadelphia area and NYC! The Virginia Glee Club presents Singfest-- a collaborative concert with a variety of vocal groups from the University of Virginia. 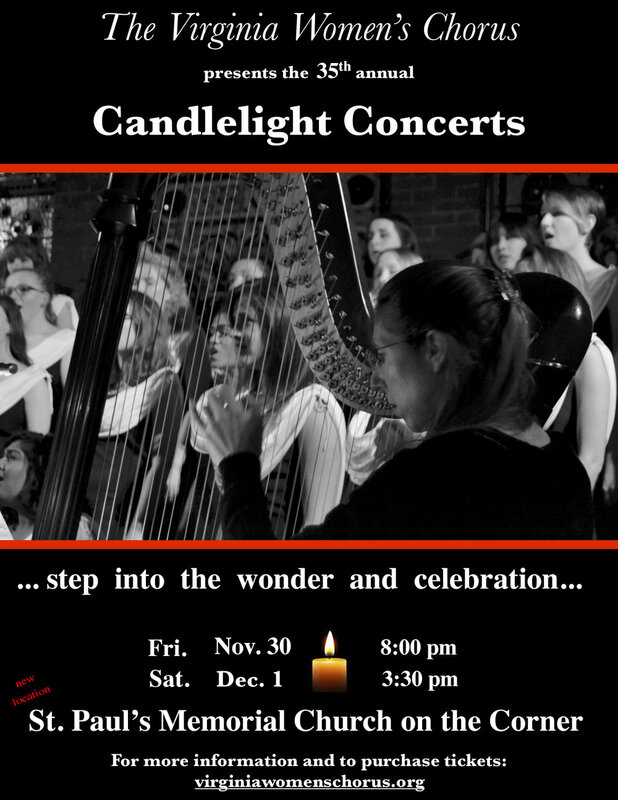 Step into the wonder and the celebration of this glorious season with the Virginia Women’s Chorus, harp, and candlelight. The centerpiece of the concert, A Ceremony of Carols, Op. 28, by Benjamin Britten is sure to delight. Professional harpist, Anastasia Jellison, will accompany the Chorus in this popular work. Anastasia currently teaches at the University of Virginia and four other universities in Virginia. Come and be greeted by the reverence of the darkness of winter, with the promise of the return of light. The beauty of the University Chapel, along with the lovely singers and their exquisite music, will soothe and inspire all listeners for the days ahead. A processional sets the tone for this concert, with music ranging from medieval to contemporary. A closing candlelight circle with the young women singing Stille Nacht allows the beauty of true multi-dimensional surround sound. The glorious beauty of harp, strings, flute, percussion, and keyboard will accompany the Chorus as the singers take you on a journey with echoes of medieval times and ethereal and vivacious arrangements of familiar carols. These concerts often sell out and it is advised that tickets be purchased early to insure seating in the Chapel. Tickets for Friday, December 1, at 8 PM may be purchased here; and Saturday, December 2 at 1 PM here. Online ticket sales will end 24 hours before each concert. Tickets may be purchased at the door if available. Student and Senior tickets are $7.50; General Admission is $17.50. Parking is available in the U.Va. Central Grounds Parking Garage located on Emmet Street and along the streets by the Chapel. The Chapel is accessible to all and handicap parking is available directly across the street.